Yeah Tell Me about it I’m an Aussie white Man and here there is NO INCENTIVE for me to work I’m Disabled too I’m always too Sick and Tired to do any work plus my ASPERGER’S Syndrome fucks me around with my brain spinning around with millions of thoughts a Second my brain spins faster then a UFO I swear it does! This is not about diversity, this is about giving females more jobs. Diveristy is just codeword for pro female. It’s also a codeword for pro-Black and pro-Hispanic. gamergate’s decision to focus on ethics doesn’t seem to be working. That is because gamergate is letting the feminists frame the narrative. This is not about ethics, this is about females attacking men. Instead of telling feminists to leave men alone, Gamergate sues SJW as a code word for women, and proclaims they are pro women themselves. I don’t think it’s the ethics part that’s the problem. 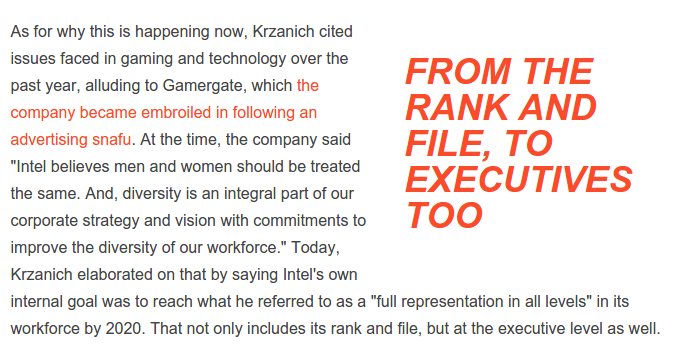 It’s #GamerGate’s attempt to separate the ethics issue from (feminist) ideology. As we know, they’re connected. Sarkesian is now the Al Sharpton of the tech industry. She is being trained well to become the next shake down artist and make her a very wealthy woman. Sarkesian is now the Al Sharpton of the tech industry. I don’t think we will be so lucky. Give Intel a little more credit. They’re not fools. They realize that if they let go of their primary workforce, and don’t hire competent people, the company WILL suffer. And if they are ready to take that risk over a bunch of imaginary brownie points, then good luck to them. The market doesn’t care about that. Only the best, most cost effective CPUs will sell. Why should there be equal representation of men and women in the work force anyway? Females have too much social privilege outside of work. You don’t see rich women supporting lower status men. Men can’t fall back to the female gender role like women can. When a man is fucked, he is on his own. Intel can afford this diversity tax … for now. women will be put to work on glass cliffs. the world can’t afford too many Adria Richards’.